After my visit to Vancouver I didn´t have any problems understanding why this city had been voted as the city with the highest living quality on earth in a recent survey. Vancouver is plain simply a dream and definetly worth a visit even outside the hockey-season. There is so much to see that it´s almost impossible to give a right impression with words only but one should definetly visit the Granville Market on Granville Island where one can try the cuisine of basically all nations one could imagine. Just as exciting is a trip to the quarter of Gastown or the Chinatown of Vancouver. The same can be said about the downtown area with the famous Robson Street and the Stanley Park, and just a short ride (2 hours) by car one of the best winter-sports areas of the world is located near to the city (Whistler Mountain). Another highlight for nature lovers is also Vancouer Island, a 1 ½ hour boat-ride removed from Vancouver. 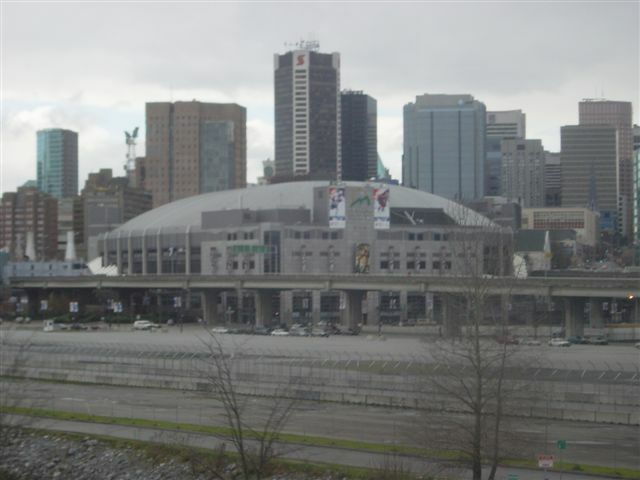 But back to the main topic of this article now, the General Motors Place, home of the Vancouver Canucks. Just as the city the arena is wonderful and seats up to 18.422 for hockey-games. The arena is located rathe central between Downtown, Gastown and Chinatown and parking spaces are available in a sufficient number. The concourses and lobbies of the arena are also very wide, so that there isn´t the typical crowd-jam between periods or after the game, a great feature one would like to see in more modern sports-arenas throughout the league. The view even from the cheaper seats in the upper level is rather good and the atmosphere has to be described as fantastic. Even for games during the week against no-name opponents only very few seats remain empty and one definetly gets goose bumps during the singing of the national anthems when 18.000 fans sing along. I went to a game against the lowly Minnesota Wild during my stay and even when the visitors jumped ahead 3:0 early in the game the fans never quit on their team and kept on pushing the Canucks back into the game. When the Canucks finally tied the game at 3 late during regulation time the wave made several rounds through the arena and the atmosphere was incredible, especially when one compares it to the rather dull atmosphere I have experienced in Calgary or at Madison Square Garden in New York. The Canucks lost the game 3:4 in overtime in the end but the atmosphere was just as good or even better during a game against the Detroit Red Wings (3:4) and the St. Louis Blues (3:2 OT in favor of the Canucks). dollars due to the exchange rates. All in all I would like to state that Vancouver is definetly always worth a visit and has a lot more to offer than only a game of the Canucks at the General Motors Place. Follow Highway #1 west. Take the 1st Avenue exit and follow 1st Avenue until you reach Quebec Street. Turn right on Quebec Street and follow it until the road forks. Take the left fork onto Expo Blvd. Follow Highway #99 south. Take the Taylor Way exit and follow south. Turn left on Marine Drive. Take exit for the Lions Gate Bridge and travel through Stanley Park and follow Georgia Street through downtown to the stadium. Follow Highway #17 north until you intersect Highway #99. Follow Highway #99 north and cross over the Oak Street Bridge. Follow Oak Street north until you reach 49th Avenue. Turn right on 49th Avenue and left on Cambie Street. Follow Cambie Street over the Cambie Street Bridge and take the first exit onto Pacific Blvd. Follow Highway #99 north. Cross over the Oak Street Bridge and follow Oak Street north until you reach 49th Avenue. Turn right on 49th Avenue and then turn left onto Cambie Street. Follow Cambie Street over the Cambie Street Bridge and take the first exit onto Pacific Blvd. The building is easily accessible by public transit and the Stadium Skytrain station. The building is also within a 15 minute walk of more than 14,000 parking spots. This includes our own underground parking Lot 987, entered off Griffiths Way on the west side of the building. Parking is conveniently located at various Impark lots surrounding our facility. Disability parking is available in Lot 314 located off of Expo Boulevard, on the West side of the Stadium Skytrain station, Lot 315 located off of Carroll Street, one block East of General Motors Place, and Lot 946, the International Village parking. We also have disabled parking spaces for vehicles under 6'6" high in the underground Lot 987 of General Motors Place. If you would like to reserve disabled parking underground, please call our Guests with Disabilities Hotline at(604) 899-7445 for more information. Seating-chart of the arena provided by www.eishockey.com.